Follow us on our adventure if you want! 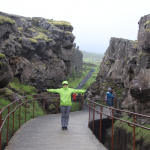 Icelandair offers this great deal where you can do a layover in Iceland on your way to Europe, at no extra cost!!! So we had decided to take advantage of this and had a fabulous 2 day stop there! Coincidentally, Larry’s cousin’s husband and son ( remember, he has A LOT of them ) Jonathon and Henry, were also spending time in Iceland AND landing at the same time we did! We had discovered this when we stopped to visit them in Virginia and had arranged to meet and spend a few days with them. Henry was there for a soccer tournament so he was billeted out to a host family and was busy playing soccer. Since we were there at the beginning of July the sun set at 23:58 pm and rose at 3:03 am with the sky never getting dark. 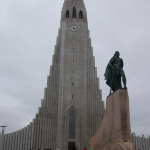 Our Airbnb was by the Hallgrimskirkja, a large Lutheran Church downtown, which was an excellent, central location. We did a self guided walking tour of the downtown core during the afternoon and then decided to enjoy an evening concert of pipe organ music in the church. There was an International Pipe Organ Festival happening and the organist we heard was a women from Prague and it was wonderful! 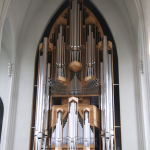 Pipe organ music in a church, priceless! ( OK, well, it did cost us $15 ) The next day we were picked up by Jonathan and we set out on the Golden Circle route. This is the most popular day excursion on the island. Our first stop was at Thingvellir National Park, this is where the ancient Icelanders held their parliamentary meetings and also where the separation of two tectonic plates has caused a rift. It is said that you can touch both North America and Europe at this location where the 2 plates come together. 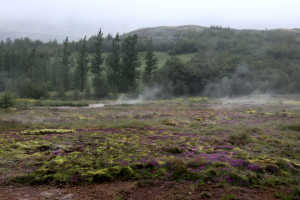 The next stop was the Geysir Geothermal Area, this was very cool as there is one geyser that erupts every 8-10 minutes and shoots up into the air about 30 meters. 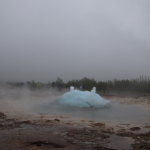 A really cool thing is the “bubble” at the start of the eruption and then the suction hole back down into the pool at the end of the eruption. We watched it erupt several times, it was absolutely mesmerizing! 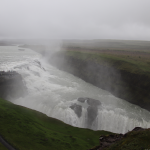 From there we went to Gullfoss Waterfall, one of the top 5 waterfalls in the world, kind of a mini Victoria Falls and Niagara Falls, and you can get up close and personal, which we did because we were wet!! It had also started to rain so that helped as well! As we finished the circle drive back to town the sun came out briefly and the surrounding landscape was beautiful. 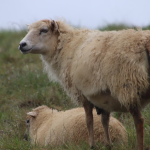 We could see the geothermal steam rising up out of the hills, as well as lots of Icelandic horses and, of course, sheep! Spending 8 hours talking in the car is a great way to get to know somebody, which we did with Jonathon. It was a long but very fun and interesting day. With a very early cab ride arranged to get us back to the airport the next morning it was time for another amazing dinner of lamb and then bed. 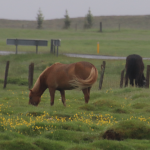 A bit of a whirl wind trip of Iceland, but definitely a place we would like to come back to someday. Click here to see a video of the geyser erupting.